Android Screen Capture is an easy and powerful tool to capture video on Android devices. 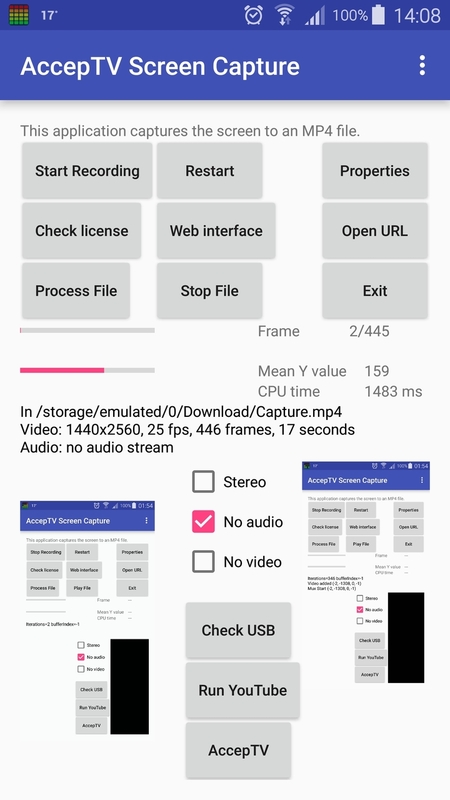 Android Screen Capture enables a video quality measurement/monitoring solution like Video Quality Monitor (VQM) to measure the Quality of Experience (QoE) on Android devices. 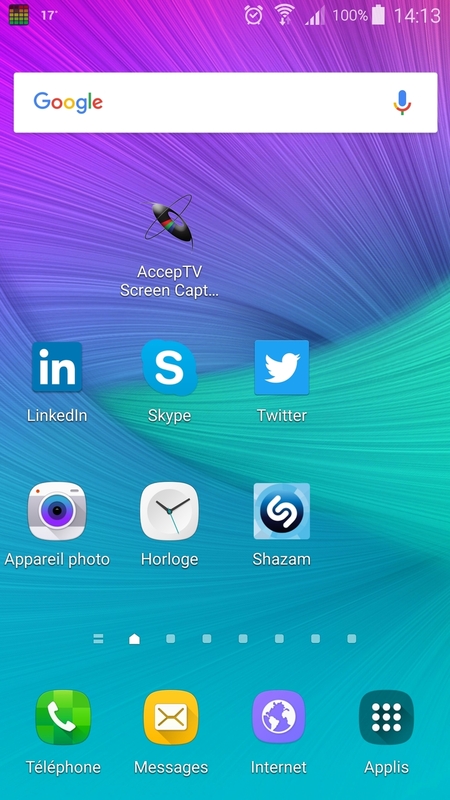 Android Screen Capture works on any device running Android version 5.0 or later (even on Android 6.0). Android Screen Capture installs itself and operates as a normal application. When you first start Android Screen Capture, the application displays the End User License Agreement and asks for various permissions (capture, file writing, Internet access, etc.). In parallel, Android Screen Capture runs an HTTP server on port 8000. Video encoding can be performed at various bitrates, from 1 Mbps to 15 Mbps (default value). The main window also enables to analyze the video by decoding it and performing computations on pixel values ("Process file"). For the moment, this feature is only implemented for demonstration and so the only computation consists in computing the mean value of the luminance for each video frame. When a file is being processed, the main window shows the current frame, its mean luminance value and the time spent to compute it. 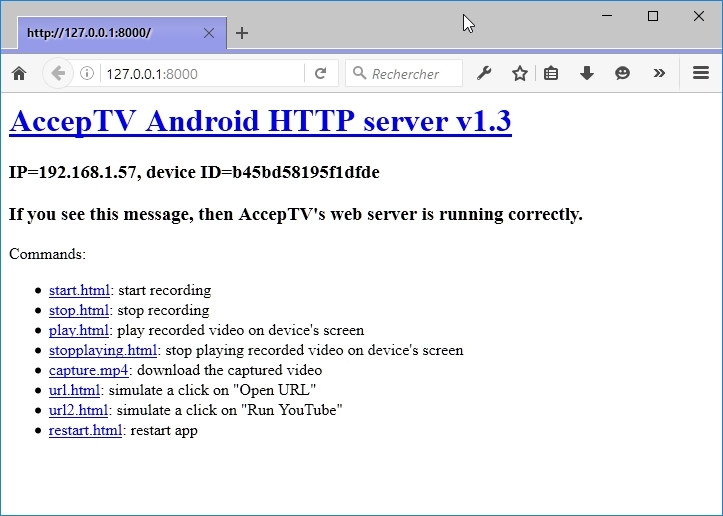 This web server also enables to open URLs (in a web browser or in an application like YouTube), to restart Android Screen Capture and to play/stop playing the captured video on the device display. The web server runs on port 8000 by default. To change this port value, contact us. To enable USB communication, Android Debug Bridge (adb.exe) must be used on the host PC. Android Screen Capture is a convenient tool to capture the screen of an Android device by running commands/calling URLs from a connected PC. Thanks to the captured videos and used with a video quality measurement/monitoring solution like Video Quality Monitor (VQM), Android Screen Capture enables to monitor the Quality of Experience (QoE) on Android devices.